ANN ARBOR, MI—The University of Michigan Alumni Center, located in the heart of the Ann Arbor, MI campus, is home to the Founders Room, a meeting room that accommodates a variety of activities. For a recent update, its AV system needed to be sophisticated, but easy to use and adaptable to a wide range of applications, including allowing the media to tie into the system for broadcast feeds at board meetings. 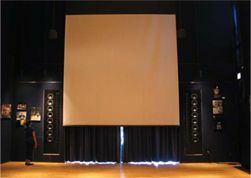 To make this all possible, installer Ann Arbor Audio outfitted a control room on the second floor, which also houses a projector. The system can be controlled via a wireless 10-inch Creston control panel or with an enabled laptop, while inputs to the system can be provided via the lectern or one of the floor boxes in each of the room’s partitioned sections. In the Founders Room, four 60- inch plasma displays were installed, one above each fireplace. Ann Arbor Audio utilized a Leon Horizon 515 soundbar speaker below each display, in addition to a pair of custom-built in-wall speakers on either end of the room. A custom-built mural audio speaker was also required to playback a recording in the lobby. For the Alumni Center, Leon’s craftsmen were provided with two challenges: developing a pair of 24- inch by 96-inch custom-built in-wall speakers for the Founders Room, and a custom-built mural audio speaker for the lobby. The enormous in-wall speakers consist of eight Peerless 8- inch drivers, along with a Radia Pro 75-inch ribbon tweeter on each side. The speaker walls are two inches thick, composed of MDF plywood with 1/4-inch industrial felt lining the interior cabinet. The grill is composed of stretched fire-retardant black mesh. For the mural in the lobby, a more eye-catching presence was desired. At the top of the mural, a customized Leon Horizon 414 configuration was installed with two fluorescent lights through the center section, and a fullrange loudspeaker at each end. A small compact flash digital player is mounted inside the enclosure and plays back a recording of the U-M men’s choir singing an a cappella version of the fight song “Hail to the Victors.” The recording playback is activated by the listener via an unobtrusive piezoelectric switch near the bottom of the mural.